This is an excellent compilation providing a snapshot of Kleiber's work from the late 20's to the early 50's just before he died. In carefully chosen repertory, IMG have found some splendid masters for their Great Conductors collection that is being released through EMI, surely a cause for rejoicing with regards to the historical collector. This Schubert Fifth is a miracle of unforced motion, quite similar to Van Beinum's equally fine recording of the work for Decca (Dutton). I also found the pastoral to be ravishingly beautiful especially in the mercurial Scene by the Brook and the concluding Thanksgiving, a piece that displays the brilliance of the Czech Philharmonic who are equally ravishing a few years later with Kletzki (Supraphon). 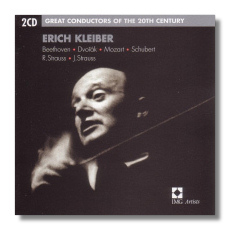 Mozart's 40th was always a Kleiber specialty and here he brings out the solemn majesty of the music in a great 1949 recording with the LPO, plaudits to Decca's astonishing sound for the period. A sprightly 'Till' with the NDRSO is also amongst the very best whilst the Dvořák 'Carnival' fairly leaps out of the speakers notwithstanding limited sound. I also enjoyed the Strauss family items with a magnificent 'Spharenklange', similarly magical as in Karajan's contemporaneous recording with the VPO (nla). Alan Sanders' biographical note makes for easy reading and as a whole, this is another triumphant coup in this series that is fast approaching necessity for the discerning historical collector. It is also a fine memorial to a truly 'great' conductor.